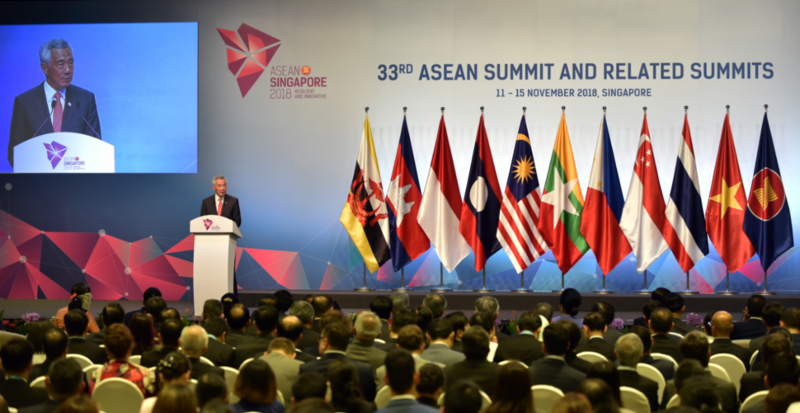 On 11-15 November, the Association of Southeast Asian Nations hosted the 33rd ASEAN Summit and related summits one year into its 50th anniversary. As it marked the culmination of Singapore’s chairmanship, what were some of the key highlights of the summits? On the diplomatic level, the Summit saw the state visit of Russian President Vladimir Putin to Singapore, where Putin attended the 3rd ASEAN-Russia Summit and the 13th East Asia Summit. It is the first time Russia has attended ASEAN summits at the presidential level since Putin became president in 2000 and is a symbolic indication of Russia’s increasing strategic shift eastwards despite its enduring priorities in the west. While Russia’s interests in East Asia have been observed as early as a decade ago, Putin’s presidential visit is timely given the geopolitical vacuum accelerated by the uncertain commitment of US leadership in the region. Singapore Ambassador-at-Large Professor Tommy Koh summed up ASEAN’s “great sense of discomfort… at the current posture of the US that seems to [be] turning against its very own creation,” including US President Donald Trump’s stance against free trade, globalisation and multilateralism. Putin seemed to be capitalising on Trump’s no-show at the Summit to make further headway in negotiating the rules of the regional order. However, Putin would be cautioned by the presence of Vice President Pence, who represented the US in the absence of Trump and is acquainted for his hawkish criticisms of Russia and China. The Kremlin also faces strategic competition with Beijing, which has shown increasing interest in regaining its “rightful” place in East Asia. On this note, it is interesting to observe that Summit Chairman Lee Hsien Loong sat beside Chinese Premier Li Keqiang rather than Pence at the Summit’s gala dinner: a diplomatic gesture that marks ASEAN’s greater priority towards engaging with China than with an uncertain US. In his speech at the Opening Ceremony, ASEAN Chairman Lee made a timely remark about the fraying of the multilateral rules-based order and urged ASEAN to remain resilient and innovative in overcoming the challenges of the years ahead. He highlighted the “concrete deliverables” that Singapore had achieved as ASEAN’s Chair, including the establishment of the ASEAN-Singapore Cybersecurity Centre of Excellence to counter cyber threats, progress on the Regional Comprehensive Economic Partnership (RCEP) free trade agreement and the redoubling of economic integration through the ASEAN Single Window and ASEAN Agreement on E-Commerce. By the Closing Ceremony, some key takeaways included: a “Resilience, Response, Recovery” framework for counter-terrorism; the joint commitment to complete the first reading of the Code of Conduct Single Draft Negotiating Text (COC-SDNT) by 2019; the selection of the world’s first multilateral air guidelines for the South China Sea; the selection of the ASEAN Coordinating Centre for Humanitarian Assistance on Disaster Management to facilitate the Rohingya repatriation process; and establishment of the ASEAN Smart Cities Network for regional digital integration. While these achievements are laudable at a time of regional uncertainty, the ASEAN Summit under-delivered in some areas. On the RCEP, ASEAN has not lived up to its expectation of completing negotiations by the end of 2018. It is a relief that five of the seven chapters have been reviewed. However, it remains disappointing that the negotiations have stretched for over six years. ASEAN Chairman Lee warned that “further prolonging negotiations puts the RCEP at risk of losing credibility and support from our stakeholders, and will mean missing a major opportunity to bring tangible beneﬁts to our businesses and citizens.” ASEAN also needs to think about what comes after the RCEP, in particular; how to achieve harmony amidst the competing visions for a “free and open Indo-Pacific”. On the South China Sea, the multilateral air guidelines are innovative and necessary as a baseline of norms to build confidence and reduce miscalculation in military encounters. However, they are insufficient to guide the behaviours of China and the US. As Collin Koh from the S. Rajaratnam School of International Studies notes, Washington and Beijing have “inked very similar provisions in bilateral agreements since 2014” and have even more “detailed rules of engagement for air-to-air encounters” than the multilateral air guidelines. Yet, these bilateral pacts have not prevented both parties from conducting aggressive manoeuvres that have resulted in near collisions, most recently on 3 October. Central to these incidents are fundamental disagreements and mutual disrespect between China and the US, which accuse one another of militarising without due regard to the other’s strategic and sovereign interests. For the first time, a three-year timeframe to finalise the Code of Conduct (COC) in the South China Sea was proposed by China during Premier Li’s 44th Singapore Lecture. Although this proposal was omitted from the Chairman’s Statement of the 21st ASEAN-China Summit, ASEAN Chairman Lee has advocated the timeframe. For a negotiation that has taken more than 15 years to progress from the 2002 Declaration on the Conduct of Parties, this target is ambitious in all regards and a hasty conclusion is unlikely to achieve an effective outcome. 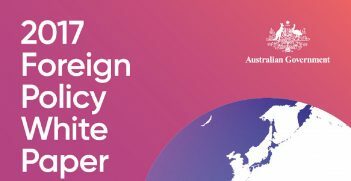 The current Single Draft South China Sea Code of Conduct Negotiating Text (SDNT) lacks key pillars including a geographical scope, a dispute settlement mechanism and a detailed provision to manage fisheries, oil and gas competition. China’s proposal for all parties to cease joint military exercises with external powers unless otherwise consulted and approved would also complicate ASEAN’s endeavour to hedge between the US and China by conducting joint military exercises separately with Washington and Beijing. It is understandable that progress on the RCEP and the South China Sea was limited, given that they are the most demanding concerns in ASEAN’s quest for resilience and innovation. This aligns with the ASEAN Way, which prioritises the process of negotiations rather than outcomes in order to proceed at a pace congenial to all parties. 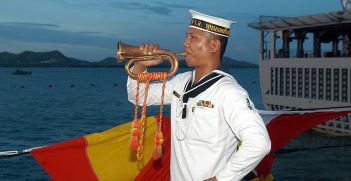 While it may compromise ASEAN’s position as an effective arbiter in enmeshing major powers within the institutionalised rules of the game, the baseline is a reaffirmation of ASEAN unity in the face of regional uncertainty. ASEAN does not have time on its side. 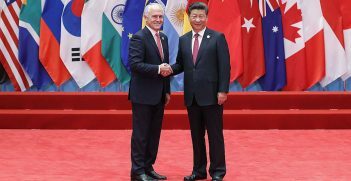 It has very limited time to change the facts on the ground in South China Sea given China’s rapid consolidation of its maritime ambitions, and any further delay on the RCEP will undermine confidence in regional integration. This is the ongoing challenge Thailand will inherit for its chairmanship in the year ahead. Tommy Sheng Hao Chai is former Editor of Australian Outlook and Risk Analyst at Foreign Brief. He holds a Bachelor of Arts from ANU and will be pursuing a Master of Strategic Studies (Advanced) in 2019.